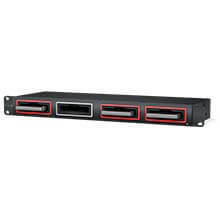 HyperDeck Extreme Control gives you traditional deck control features with a built in editor for automating the ingest of legacy videotape based programming. Combined with HyperDeck Extreme, you get a professional deck solution that’s exciting and fast to use. There are transport control buttons, timecode, deck status, plus a large search dial with electronic clutch for jog, shuttle and positioning. Controlling up to 8 separate decks is possible using standard RS‑422 ensuring compatibility with virtually any type of deck. It’s even possible to edit between different video standards, so you can up convert old 4:3 interlaced SD masters to 1080p HD in 16:9 via a Teranex Express converter. The built in editor allows deck to deck editing. 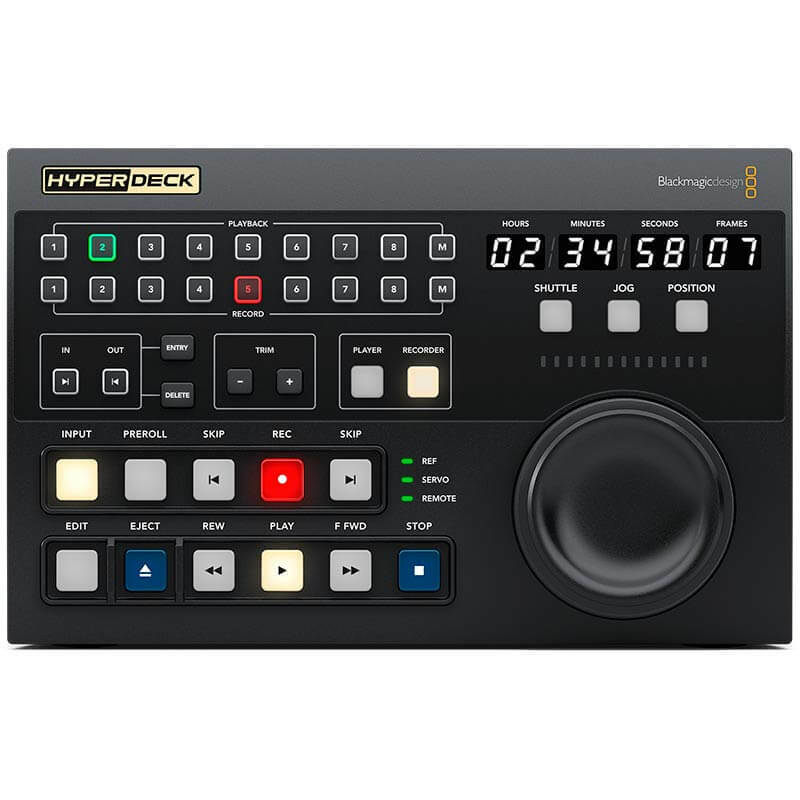 Operating the same way as traditional decks, the controller can operate both the HyperDeck recorder and the legacy broadcast deck all from the same front panel. This allows editing of old videotape simply by selecting the player button and entering in and out points on the tape and then selecting the recorder and pressing edit. The HyperDeck Extreme Control will now cue and play the broadcast deck while recording on the HyperDeck. Often streaming services need 1080p24 masters. That’s easy as it’s possible to add an inline Teranex Express converter to de-interlace, up convert, aspect ratio convert and remove pulldown while editing. 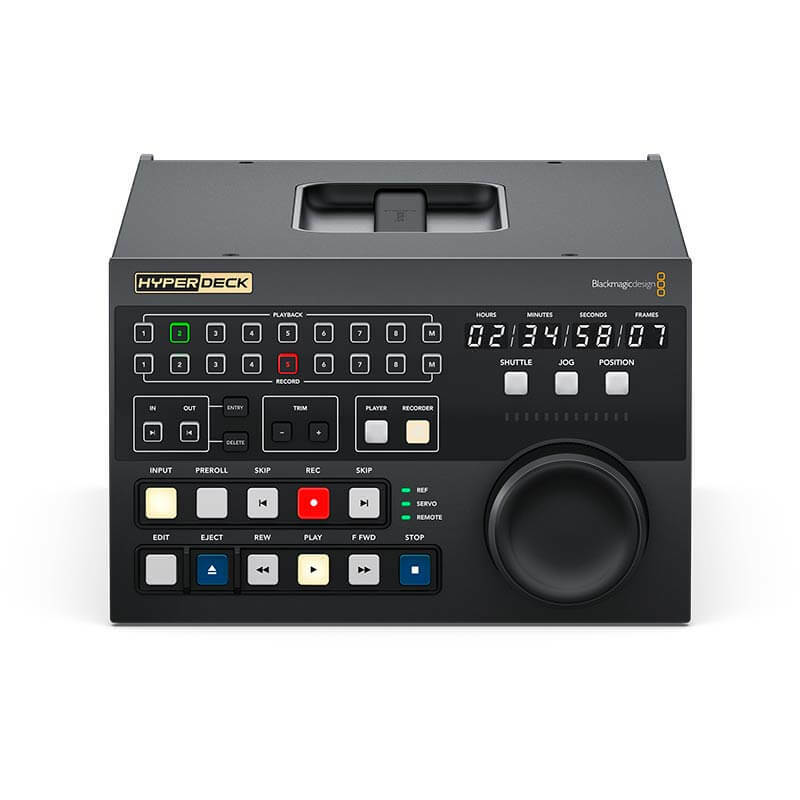 The top of the HyperDeck Extreme Control includes a row of 8 buttons for the recorder selection and a row of 8 buttons for the player selection. There’s a built in remote control router that makes multi deck work possible. 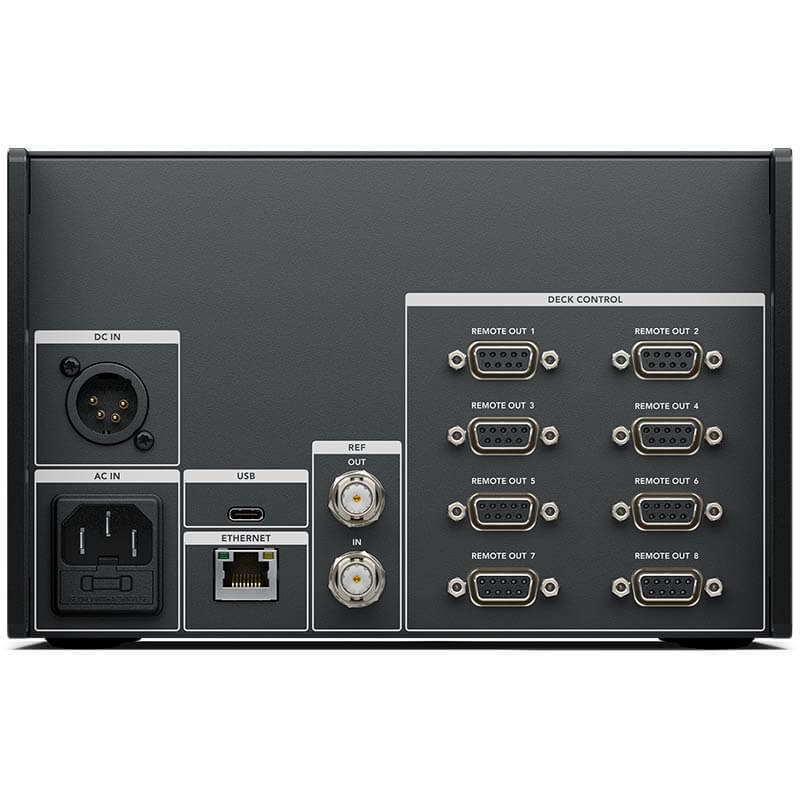 The connections are all standard RS-422 control so each device can be plugged into one of 8 rear mounted RS-422 sockets. You can even use the 8 ports to control 8 HyperDecks. 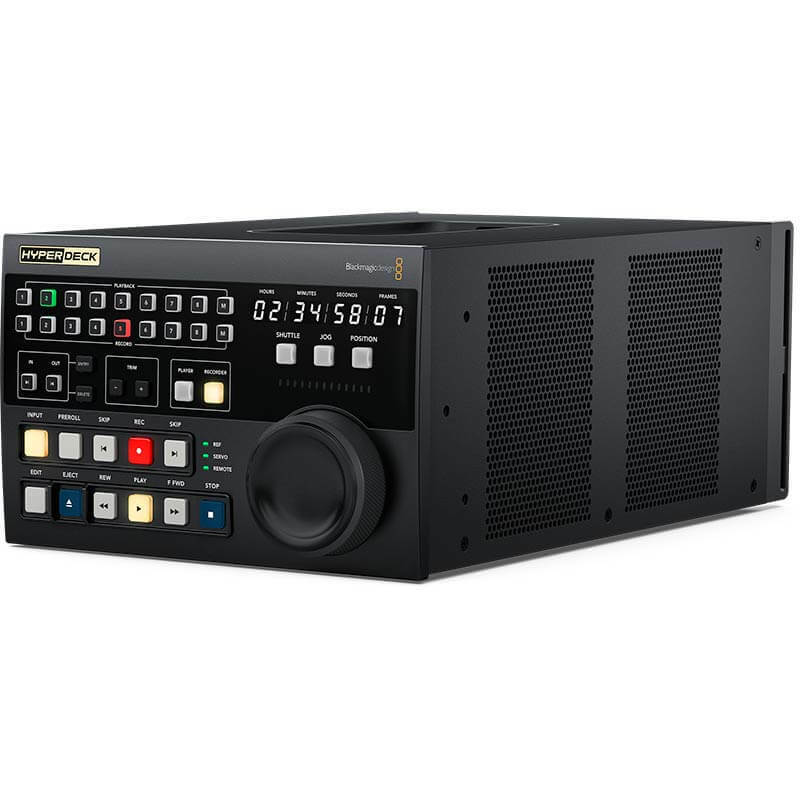 The RS-422 control has been tested to ensure compatibly with legacy broadcast decks such as the BVH-2000 series 1 inch C format machines, D2, Betacam SP and Digital Betacam broadcast decks. The transport controls are a hybrid of controls from HyperDeck as well as traditional decks. You get buttons for rewind, fast forward, stop, play and record. To protect videotape masters, recording requires pressing both REC and PLAY. There's an eject button for ejecting cassettes, an input button for changing EE/PB modes plus a pre-roll button for cueing the tape. You get familiar transport controls, such as PLAY, which when pressed during a recording, will cause the recording to stop and then the deck will continue to play from the same point. To start a recording, press both the REC and PLAY button simultaneously. If you hold down the REC button while a HyperDeck is in record it will change cards. When either REW or F FWD is pressed, the deck will shuttle reverse or forward at the maximum rate. The search direction indicator will also show full speed shuttle. Available when used with HyperDeck, the SKIP REW and SKIP FWD buttons will move to the previous clip or the next clip in the recording. The high quality search dial features both jog and shuttle plus an electronic clutch that stops the knob at the end of the shuttle travel or allows free spinning when in jog. HyperDeck Extreme Control replaces varispeed with a position function that allows rapid movement up and down the recording. The search dial uses twin bearings so you can free spin it for fast jog. 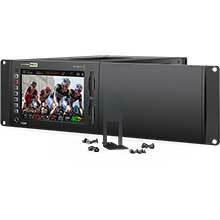 Full deck status is included and this includes a large easy to read timecode display. This display indicates the timecode of the current selected deck and the timecode source switch will control what’s displayed on the time counter. The horizontal light bar indicator allows the user to see the position of the search dial and provide a visual feedback, which is important when working with remote decks. The servo indicator light will show when the deck is in play or record mode and the servo system is correctly locked. Because remote decks will still display the time counter and transport state, the remote indicator will let you know if the deck is in remote. There’s even external video reference status. For editing, you need to enter an in and out point for the remote deck. Simply select the IN or OUT buttons and the ENTRY button simultaneously to enter the points. To display each edit point on the time counter display, simply press the IN or OUT buttons only and the time point will be shown. While the entry button is used for entering the in or out point data, you can also clear the in and out points by pressing the IN or OUT buttons while pressing DELETE. To trim edit points, you can press the TRIM + or - button while pressing the IN or OUT button, and you will advance or delay the edit point by 1 frame at each press. For cueing decks a pre-roll button is included. When this button is pressed, the tape machine will run to the pre-roll point which is generally 5 seconds before the IN point. If you are using an older broadcast deck it could take a few minutes for the deck to get to the cue point as the machine has to spool the tape. Although a HyperDeck will cue instantly. If the PREROLL button is pressed when simultaneously pressing the IN or OUT point then the deck will cue to the IN or OUT point exactly. This feature is great for cueing to a specific location set via the IN or OUT points. Once you have your in and out points set, you can perform the edit automatically by pressing the EDIT button. If the EDIT button is pressed before setting the IN point, then the current tape position will be automatically entered as the IN point, and then the editing will be performed. This means you can select the edit button and it will set the IN point and then perform the edit all in one step.